Over the past year, Moscow has conducted radical rearmament and significantly increased the number of its troops stationed in the Crimea. Now the troops deployed on the peninsula will perform two combat duties at once; protect Russian interests in Crimea and act in the far sea zone. According to Defence Minister Sergei Shoigu, by the end of 2014, as part of the deployment of a self-contained group of forces in Crimea, nearly 100 units, departments and organizations have been set up, and new equipment has been supplied to them. Recently, in order to supply a rifle cartridge to the Black Sea Fleet, Moscow had to coordinate the entire process with the Verkhovnaya Rada (Supreme Council) of Ukraine; a requirement from the agreement on the status of the Black Sea Fleet. During the past 20 years the Ukrainian side has displayed a complete unwillingness to allow any repairs or supplies. As a result, the fleet became dilapidated and lost its combat potential, allowing the Americans to get a foot hold in the region. American warships have appeared in the Black Sea relatively recently, just when it became clear that they were not in danger. Do Russian long-range bomber flights threaten NATO? According to the defence minister, new facilities continue to be built in five military bases on the peninsula, and the existing buildings have undergone major repairs. Moscow has received the opportunity to carry out a radical renewal of its forces grouped on the peninsula. The troops’ strengthening has occurred within the framework of rearmament program until 2020. About 300 units of new weapons systems and military equipment have been transferred to Crimea. Military units have received the latest self-propelled anti-tank systems “Chrysanthema-C”, 152-millimeter howitzers “MSTA-S”, and multiple launch rocket systems “Tornado-G.” The coastal troops have been reinforced with the latest mobile anti-ship system “Bal”, which is made up of cruise missiles X-35 “Uran”. According to the Ministry of Defence, stationing of the Tu-22M3 and operational-tactical “Iskander-M” systems on the peninsula is the next stеp to restore the Russian presence in the Black Sea region. The stationing of these systems in Crimea guarantees, if required, the destruction of US interceptor missiles based in Romania. A Tu-22M3 will not only be able to support the strike with cruise missiles X-22 and X-15, but also to eliminate the naval presence of the US in the Black Sea. Chairman of the US House Intelligence Committee Mike Rogers officially recognized the destructive potential of the interceptor missiles by cautioning alerts against some vague “threats” from Moscow. This summer, one of the missile formations of the Western Military District, which are armed with the operational-tactical missile system “Iskander-M” and long-range aircraft Tu-22M3, conducted a demonstration of their capabilities in the Black Sea, conducting exercises to destroy critically important facilities of the imaginary enemy, with ground and air based precision weapons, the Ministry of Defence reported. 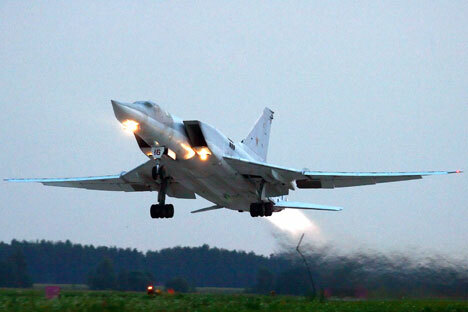 “Tu-22M3s allow scope to neutralize both current and potential threats that may be relevant for Russia in the region, such as the destroyers entering the Black Sea that would carry a direct threat to the functioning of the Russian strategic nuclear forces,” Igor Korotchenko, editor of “National Defence” magazine opined. The regular presence of the Tu-22M3 in Crimea is likely before 2016. It is still unclear when the tactical “Iskander” will be stationed there. Shoigu stated unequivocally that such systems and bombers can be stationed on the territory of Russia at any time and in any place. “We put them wherever we want!" the Minister of Defence said.